Don't you love the idea of eating your dinner out of one big bowl? In the early part of this year, I renewed my commitment to eating more healthy foods such as fruits and vegetables. (It's an ongoing process.) I became fascinated with the idea of vegan bowls - proteins, grains and toppings in one comforting, healthy lunch or dinner bowl. 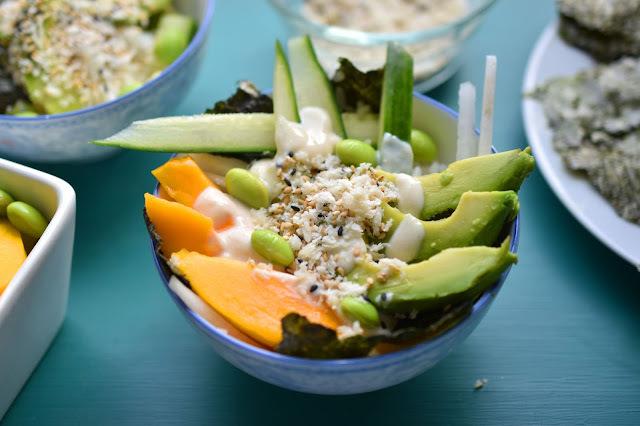 Vegan bowls are ideal for summer, because you can do minimal cooking on hot days (or none at all really if you opt for a raw foods bowl). 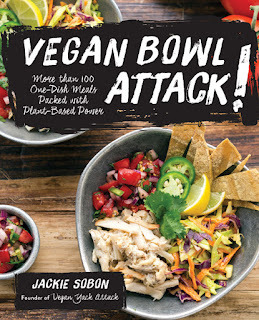 I was excited to learn that vegan food blogger Jackie Sobon's new cookbook is called Vegan Bowl Attack! : More than 100 One-Dish Meals Packed with Plant-Based Power . It came along at just the right time for me, as I was looking for vegan bowl inspiration. 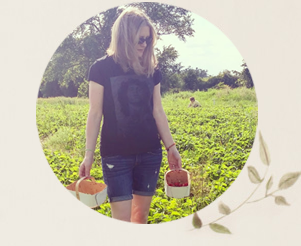 You might know Jackie as the creator of the blog Vegan Yack Attack. Vegan Bowl Attack! features over 100 simple and nourishing vegan bowls. 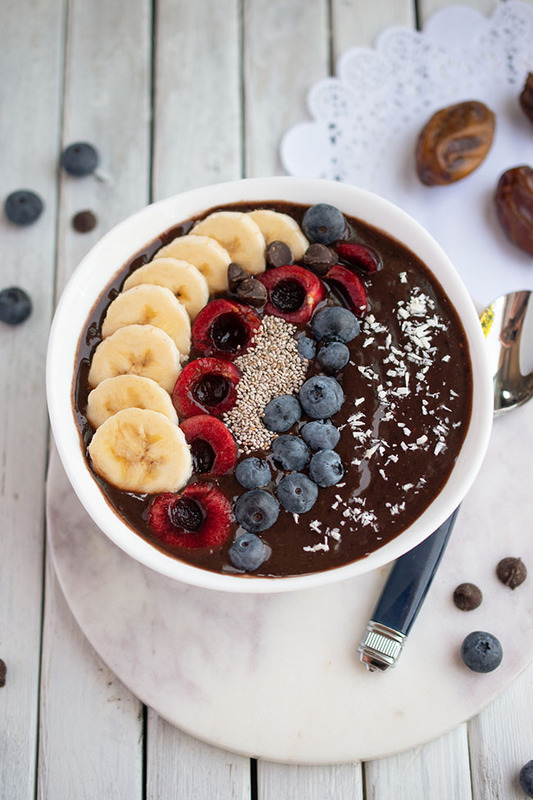 Many combine vegetables, whole grains and protein, but Jackie also thinks outside the box bowl, offering innovative breakfast and dessert recipes that take advantage of one-bowl eating in refreshing new ways. You definitely don't need to be vegan to enjoy the selections in this book - anyone can take advantage of these healthy and often family-friendly meal options. I chose to try Jackie's Spicy Sushi Bowl and share the recipe with you all. We are big fans of vegetarian sushi in this house and I know that many of you are similarly sushi-addicted. The sushi bowl makes for a more casual affair than rolling your own maki sushi. You still make sushi rice and chop up yummy "fillings" like mango and avocado, but instead of rolling, you throw it all into a bowl. Fun and easy, it would be a great option for buffet food at a party. 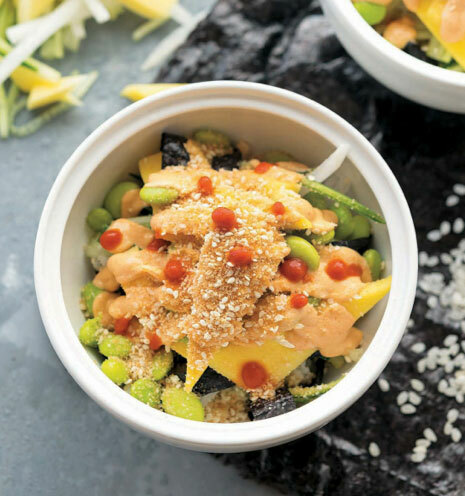 Jackie's recipe includes instructions for making your own vegan spicy mayo, a delicious topping to drizzle on (or drown) your Spicy Sushi Bowl. A note on daikon radish: my regular grocery store didn't have any in, so I went to a Chinese grocery store to get some. They didn't know what daikon was (because I believe that's a Japanese word), so look out for "white radish" or "Chinese radish." In my family, we all loved putting together our own sushi bowls. In the photo above, you can see my daughter's sushi bowl on the lower left and mine next to it. The kids were really happy with the meal (and that doesn't happen all that often, trust me). I was happy I got some vegetables into the kiddos without having to nudge, persuade (and basically force) them. There's a gluten-free option too, if you go with gluten-free bread crumbs. If you haven't had your sushi via a bowl before, I urge you to try this recipe! You could definitely add some of your other fave toppings as desired. If you are in the US or Canada, enter to win a copy of Vegan Bowl Attack! below. I also made the Tex-Mex Potato Salad. I doubled the recipe to take to a potluck party and everyone really enjoyed it. I am looking forward to making more recipes like White Bean Beer Fondue, Cabbage Roll Bowl, S'Mores Pudding Bowl and especially Mini-Cinni Rolls With Cashew Cream Cheese Drizzle! Do you eat bowl meals often? What vegan options would you add to a sushi bowl? Place the sushi rice, water, and rice vinegar in a pot over medium-low heat, partially cover, and bring to a boil. Lower the heat and simmer for 20 to 25 minutes until the rice is soft, but not mushy. Fluff with a wooden spoon. Divide the nori strips among 4 bowls, crisscrossing them. 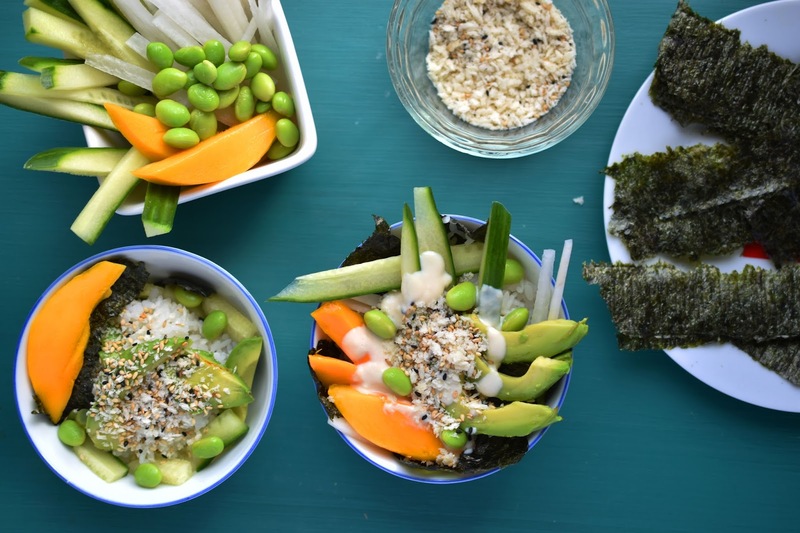 Divide the cooked rice among the bowls, as well as the cucumber, daikon radish, mango, avocado, and edamame. Combine the panko bread crumbs and sesame seeds in a small bowl and then sprinkle the crunchies over each bowl. Finish each bowl with a drizzle of spicy mayo. Serve immediately. Recipe reprinted from Vegan Bowl Attack! : More than 100 One-Dish Meals Packed with Plant-Based Power By Jackie Sobon, published by Fair Winds Press. 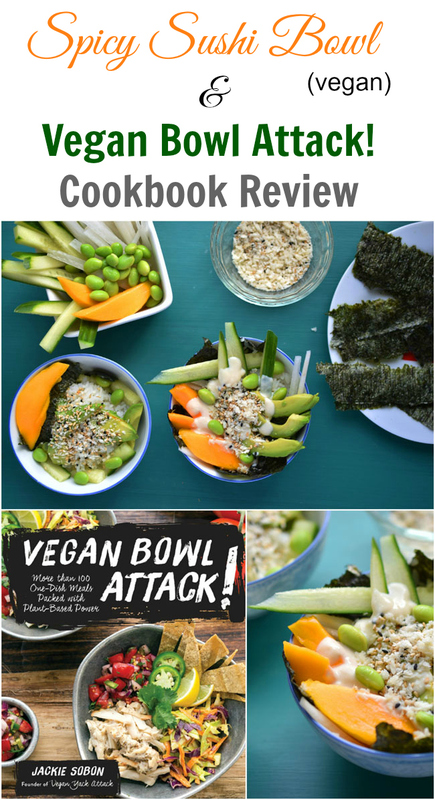 Enter to win a copy of Vegan Bowl Attack! Residents of the US and Canada may enter to win a copy of Vegan Bowl Attack! using the rafflecopter widget below until August 31st. *I was provided with a book for review purposes. I received no other compensation. This post contains affiliate links. Yes we eat bowl meals often with some sort of stirfry. Stirfrys are my favourite way to make a quick, healthy meal too! I eat bowls all the time! I've been eating a pasta, ratatouille, and Tofurky Italian sausage bowl for lunch this week! I don't often eat bowl meals but do enjoy them when I do. I would add shitake mushrooms! We only have a few one bowl recipes so winning a book like this would really change things up! We don't eat land animals, so this would be great! I love anything that is all in one bowl. Looks amazing. I will have to try making them! We just had our first bowl meal a few weeks back and now are having them about once a week! I love bowl meals! My sister makes a quinoa/vegetable (avocado, carrot, sweet potato, corn) bowl and it's a favourite of mine. I love bowls! Any combination of grains, veggies and sauce. I eat bowls all the time! I'd add shiitake mushrooms to this bowl! I love shiitake mushrooms! I need to eat them more often. I eat bowl meals all the time. I usually eat noodles with a lot of roasted vegetables. I eat bowls everyday for lunch! I eat bowls all the time! I'd add tempeh and maybe quinoa. I love bowl meals! I've never had a sushi bowl meal before though - wow it looks good. One of my favourite sushi rolls is tempura yam with avocado on top - would definitely try to incorporate that into a bowl! I love to make vegan bowls....mixing all kinds of fun stuff. BUT I have actually never tried/made a vegan sushi bowl. Adding it to my list of want to make/eat! Fingers crossed for this giveaway! Thank you! I don't eat bowl meals enough! Quinoa would be a great addition!